This Roasted Cauliflower Quinoa Salad is the perfect dish to ring in the New Year. It’s loaded with healthy ingredients that will make sticking to eating healthy a breeze. I’m always struggling to find ways to jazz up lunch. It’s always the same rotation of Caesar salad and a turkey sandwich on whole wheat, both of which are getting extremely old. So, I set out to create new recipes that can be made ahead and easily prepared during the busy work week. Often times I’m eating at my desk or nibbling in between photo shoots or recipe prep, so make-ahead recipes are a must. I ain’t got time for gourmet! The inspiration for this Roasted Cauliflower Quinoa Salad came from my Roasted Butternut Squash Quinoa Salad recipe. Really, it was you, my lovely readers, that inspired me to revisit the recipe. Apparently, you love the recipe so much that it has remained in the #1 position for almost an entire year. Crazy, right? Deservedly so, because it’s a damn tasty recipe. I always have cauliflower handy. It’s an extremely versatile vegetable… So versatile, people have found a way to turn it into rice. I believe that deserves a round of applause, don’t you? I haven’t ventured down that path yet, but it’s only a matter of time. I’m partial to roasting. It’s my favorite cooking method, and that’s probably because it’s so dang easy. Not only that, but just about everything tastes better roasted. While everyone’s making cauliflower rice, I’ll be over here doing things the archaic way. As I mentioned before, this recipe can be made ahead and stored in the fridge until you’re ready to chow down. The only real work involved is chopping and roasting the cauliflower, prepping the quinoa, and preparing the salad. This salad is loaded with flavor. The cauliflower gets a sprinkling of Parmesan cheese before it heads to the oven, so there’s that. Um, toasted pistachios…lots of ’em! I always keep a jar of toasted Diamond Pistachios handy for snacking, because, let’s be real, they’re the best nut ever! A few handfuls of pistachios, dried cranberries, Feta cheese, and scallions get folded into the quinoa along with the roasted cauliflower. Hello, flavor town! The salad is delicious cold or served at room temperature. If you require more flavor, then I highly recommend drizzling your salad with the tahini dressing I made to go with it. Not necessary if you’re feeling lazy that day and don’t feel like making it but most definitely delicious. Cook the quinoa according to the package instructions. Allow it to cool slightly and fluff with a fork. Add the cauliflower florets to a large bowl. Drizzle with 3 tablespoons of olive oil. Sprinkle with a few generours pinches of salt and pepper. Add the grated Parmesan cheese; fold to combine. Transfer the cauliflower to a baking sheet and drizzle over the remaining 1 tablespoon of olive oil. Bake for 25-30 minutes, stirring occasionally for even browning, or until the cauliflower is tender and slightly charred. Remove from the oven and allow the cauliflower to cool slightly. In a large bowl, combine quinoa and remaining salad ingredients. Fold to combine. Add the cooled cauliflower and gently fold to combine. Serve immediately with a side of tahini dressing, or transfer to an airtight container and store in the fridge until ready to serve. Add the garlic to the bowl of a food processor. Pulse to chop. Add the remaining dressing ingredients and pulse until smooth. With the food processor on, slowly drizzle in 2 tablespoons of warm water to thin the dressing. Season with salt and pepper to taste. I LOVE cauliflower, quinoa and pistachios! This combo sounds SO good! I love diamond nuts, so this is obviously going to be great! LOVE roasted cauliflower. Love the crunch from the pistachios as well! Now this is the type of salad I could eat for any meal of the day and be a happy girl! 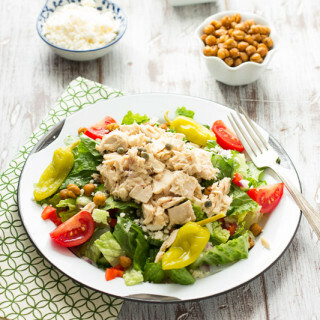 Love the use of pistachios here and that tahini dressing takes it over the top!